The Fund awarded Salford Museum & Art Gallery a grant of £7,000 for the acquisition of the above painting. This is a large painting, mixed media on canvas, measuring 183 x 137cm. Julian Spalding regards it as one of the finest and most exuberant of McCartin paintings of the 1990s: ‘…her images are always sparked by people and events she has seen, such as these two girls chatting on the London Tube. She is, in my opinion, one of the most brilliant observers, in paint, of contemporary urban life. You have to see her paintings in the flesh to appreciate their brilliance and exuberance. I’ve rarely seen anyone use so much of what paint can do, scratch, drip, rub, scrape, dash, touch, brush, glaze, wipe, spread, mark and line. She works the surface like a superbly inventive, passionate lover, but that’s just on the skin. Beneath it, glowing through everything, is the colour. McCartin herself wrote ‘as an artist from a working-class background, I have always felt somewhat of an Outsider in the contemporary art world and this is reflected in my choice of image. I paint people on the edge of society, often struggling to fit in and survive. I try to… create direct and passionate imagery which will connect with a wide audience. 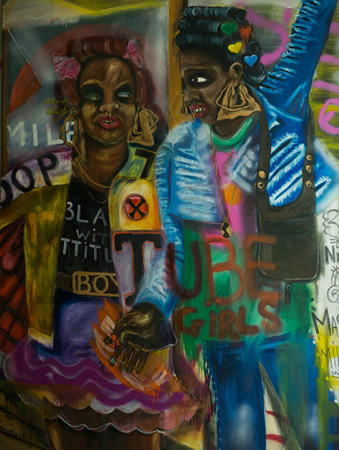 For the past few years I have been painting urban tableaux derived from real street incidents and characters…’; ‘Tube Girls’ is one such work.